"The 29th September, the general d’Allonville has three columns in movement. They left Eupatoria at three o’clock in the morning. The first, directed to the south-east, towards the Lake Sasik, by the sea was to take position by Sak. There, they met a few Russian squadrons, but they were easily dealt with by the fire from two gunboats. The second column, commanded by Muchir Pacha, advanced towards Doltchak which they ruined during their passage to deny provisions to the enemy. The general d’Allonville is at the head of the third column, composed of twelve squadrons from his division, and the horse artillery battery of captain Armand. Two hundred Bachi-Bazouks preceded them; and attached were six Egyptian battalions. They marched for Chidan by way of Doltchak, where they would rendezvous with the two other columns, and they were reunited around ten o’clock in the morning. They had before them and had to shoot at enemy squadrons that were successively calling up their reserves. There were eighteen squadrons of Uhlans, several Cossack squadrons and artillery. They maneuvered by withdrawing and seemed to be prepared to turn our right, to come between the lake and us. 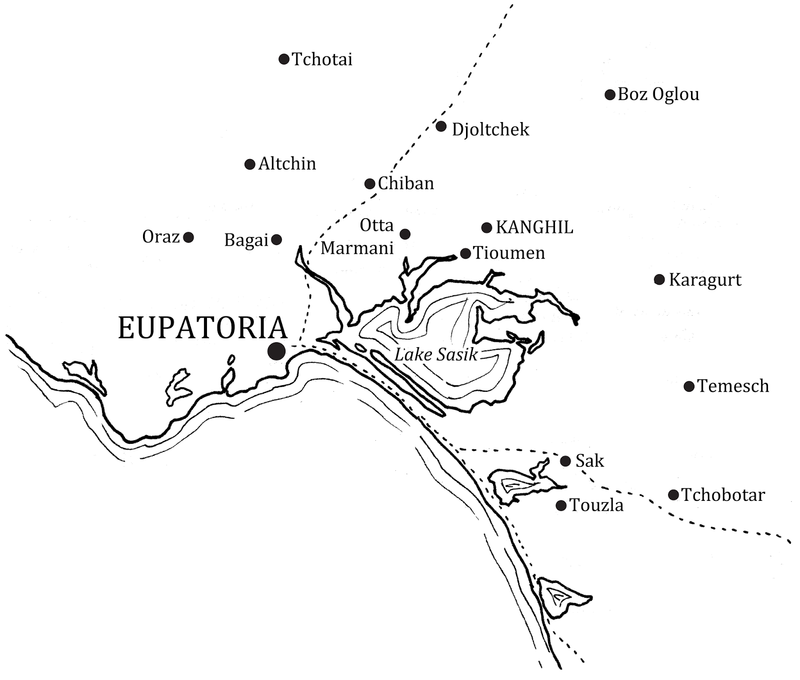 Map of Eupatoria and environs showing Kanghil, Doltcak, Lake Sasik. Map by Andy Mason. The general d’Allonville, leaving in reserve the troops of the Muchir, attentively observed their movement and marched slowly to raise their confidence; after a first halt, there was a second to refresh the horses. General Armand-Octave-Marie d'Allonville. He was made Grand-Croix of the Legion d'Honneur following the Battle of Kanghil and awarded the Order of the Bath. The Russian squadrons disappeared behind a fold in the terraine. 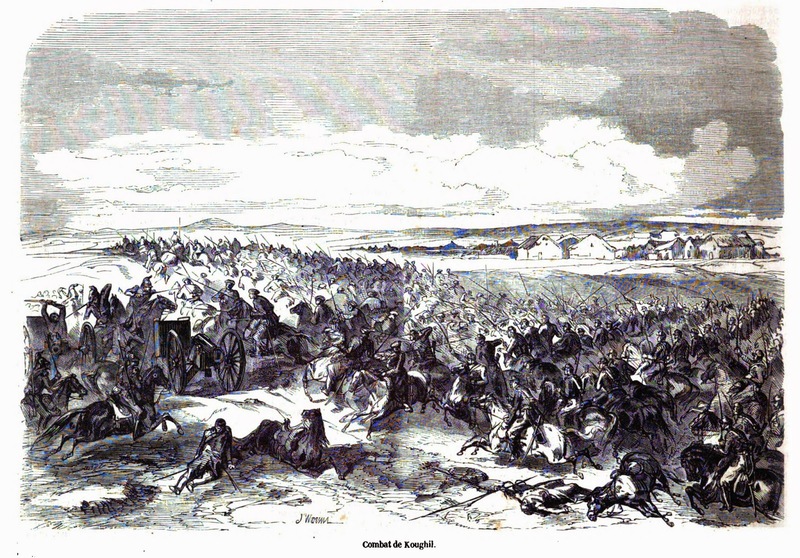 But while the Bachi-Bazouks,in the front, indulged in their usual fantasies which the Russians did not meet, suddenly an order from General Allonvile, the 4th Hussars went silently to horse and set off at a trot toward the village of Kanghil. They disappeared into a depression on the ground, and almost immediately the sound of two cannon shots were heard and that of firearms. The 6th Dragoons, who supported the movement of the 4th Hussars, arriving at the fold in the land, where the regiment had disappeared, could realize what was happening: a fight was taking place between the 4th Hussars and the Uhlans. The speed of movement of the regiment permitted them to meet the Russian squadrons with l’arme blanche. The Russians, surprised, had received the shock standing still. There was then, between these two worthy oponents, a lively melee; our Hussards had the advantage over the surprised Uhlans, which all the theories say, result in the mass multiplied by velocity. The Russians, recovering from their surprise, reform and take the offensive against the small number of their adversaries. But, at that moment, the squadrons of the 6th Dragoons supported by the 7th in the third line, arrived forced them to make a precipitous retreat and then harrased them for two leagues. With the enemy taking over at any point and fleeing in all directions, the general Allonville stopped squads and collected all that remained on the battlefield. During this day, we captured six cannons (three guns and three howitzers), twelve artillery caissons and a field forge with all their equipment and horses, 169 prisoners of which one was an officer, Lieutenant Proscopwitch, of the 18th Uhlans, and 200 horses. The enemy left on the ground fifty dead, amongst which was Colonel Andreonksi of the 18th Uhlans, of the Division of General Korf, who had commanded that day before us, and, we believe, was a Russianc cavalry officer of great merit. Our losses, in comparison, were very minimla. We have six men killed, and 25 wounded, Messieurs Pujade, aide de camp to General Valsin, et Silbert Cornillian, officier d’ordonnance to the same general, are amongst their number. The artillery was attacked with great impetuosity that only two guns could be fired and the Hussars captured them; the other four were limbered up and captured by the 6th Dragoons in their charge. The General Walsin-Esterhazy, in the front of his squadrons which he led to the charge with a heroic ardour, was, for an instant, alone with his staff in the middle of the Uhlans, parrying the thrusts of their lances with a riding crop, knocking the double-barrelled pistols out of the hands of those which came too close to him. He came out of the fight safe and sound. It was not the same for his aide-de-camp, the Captain Pujade, or his officier d’ordonnance; both were thrown from their horses; which had been killed by lance thrusts. Pujade, hit several times on the head with sabre cuts, continuing to parry the blows on him, brought down two enemy cavaliers, but had his right hand chopped and two fingers cut off." 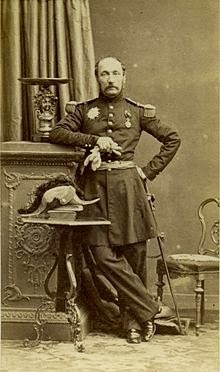 FYI the officier d'ordonnance to General Walsin Esterhazy was Lieutenant Charles Louis de Sibert de Cornillon and he eventually died of septicaemia from those lance wounds.